First Survey of MPO Networks Finds Deployment Expected to Grow By More Than 20 Percent in the Next Three Years | VIAVI Solutions Inc.
San Jose, Calif., September 25, 2018 – Viavi Solutions Inc. (VIAVI) (NASDAQ: VIAV) today released the results of a global study that examines the rise of parallel optics and multi-fiber connectivity in service provider networks, enterprises and data centers. According to the VIAVI 2018 MPO study, deployment of ribbon fiber and multi-fiber push on (MPO) connectors is expected to grow by more than 20 percent in the next three years, creating significant challenges for network operators and cabling contractors. As bandwidth demands escalate and network infrastructure is pushed to the limits, multi-fiber connectors are becoming increasingly required to meet the demand for fiber and cable density, and support for next-generation architectures that utilize parallel optics. As a result, cabling contractors and network technicians are now challenged to deal with added complexities and increased time needed for testing and troubleshooting multi-fiber networks. The VIAVI 2018 MPO study reveals the challenges and opportunities experienced by hundreds of installers, managers and operators of telco and enterprise networks. The study is available for download at: www.viavisolutions.com/MPO. Four out of five respondents spend up to 20 percent of their work week troubleshooting physical network issues. During the ECOC 2018 Exhibition this week in Rome, VIAVI (Booth #506) will be showcasing MPO solutions, such as the industry’s fastest and first fully automated MPO inspection workflow, as well as a comprehensive portfolio of tools that simplify and accelerate high speed network test. 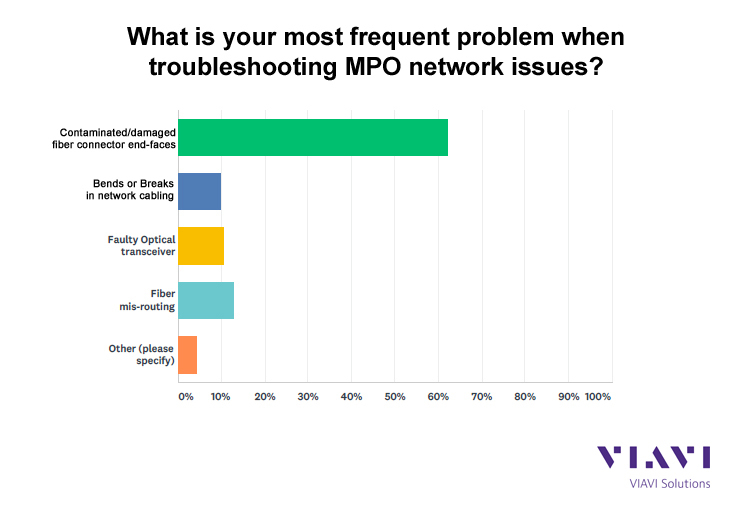 VIAVI conducted the first global MPO study to gather insight into the pervasiveness of multi-fiber connectivity and the ensuing challenges. Study results were compiled from 200 respondents selected based on experience working with MPO technology, including designers, installers, managers and operators of service provider and enterprise fiber networks. Respondents represented diverse geographic regions with 74 percent in North America, 12 percent in UK and EMEA, 10 percent in Latin America, and 4 percent in Asia Pacific. Responses were collected in April of 2018 via online surveys.